A TBV settings file ("<name>.tbv" or "<name>-<run#>.tbv") contains all relevant information to analyze incoming functional data, including information about the scanner, data points, number of slices and matrix size. The "TBV File" dialog provides a convenient and save way to inspect, create or modify TBV files. 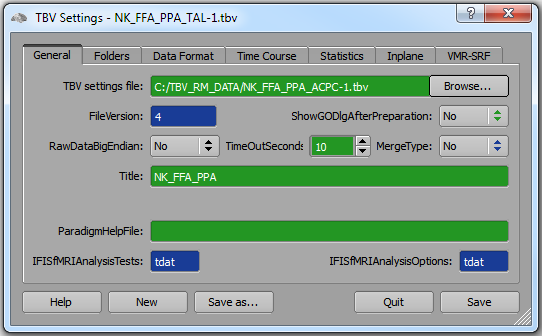 Using an external text editor, you can also modify a TBV file directly. It is, however, recommended to use the TBV Settings dialog because it ensures that syntactically correct TBV files are created when clicking the Save or Save As button. To open the TBV Settings dialog, click the Edit TBV File item in the Files menu. You will see several tabs describing various subsections of the TBV file. To get a short tool tip explanation of an entry, locate the mouse cursor over a field without moving the mouse for a short time. To get more extensive information for each item, click the question mark on the right side of the dialog's title bar and then click on an item. You can also find a description of each field in the section TBV settings file. Details about the settings in the Data Format tab are described in subsequent topics. The settings of the VMR-SRF tab are described in the Preparing Advanced Visualizations topic. Red color: These entries must be correct to ensure proper real-time processing. Check the red values and modify them if necessary. As an example, the "WatchFolder", which is the directory where the real-time data arrives, must be specified correctly to ensure successful data analysis. Green color: These entries may be changed but they are not critical for proper real-time processing. Change these options to adapt the analysis and the display to your needs. As an example, you can chose to run 3D motion correction or not. Blue color: These entries should normally not be changed. They reflect either important information which is automatically specified (i.e. by reading header information from the data files) or they reflect entries which are not (yet) used by the program.